Murtagh hes­i­tat­ed, as though choos­ing his words care­ful­ly. “Weel, it’s just…he’s decid­ed as it would be best for ye to leave him here and go back to Scot­land. He—”The rest of what he was say­ing was lost as I pushed my way rude­ly past him. The heavy door swung shut with a soft thump behind me. Jamie was doz­ing, face­down on the bed. He was uncov­ered, clad only in a novice’s short gown; the char­coal bra­zier in the cor­ner made the room com­fort­ably warm, if smoky. He start­ed vio­lent­ly when I touched him. His eyes, still glazed with sleep, were sunk deep and his face was haunt­ed by dreams. I took his hand between both of mine, but he wrenched it away. With a look of near-despair, he shut his eyes and buried his face in the pil­low. .……I want­ed to stop Jamie, to tell him that he didn’t need to go on, must not go on, but I bit my lip hard to keep from speak­ing and clasped my own hands tight togeth­er to keep from touch­ing him.…..
“Me?” My voice, unused for so long, came out of my strained throat as lit­tle more than a croak. He nod­ded, look­ing down at the pil­low again. He shook his head slow­ly, still gaz­ing down at his feet. “The…it’s all linked for me now. I can­na think of you, Claire, even of kiss­ing you or touch­ing your hand, with­out feel­ing the fear and the pain and the sick­ness come back. I lie here feel­ing that I will die with­out your touch, but when you touch me, I feel as though I will vom­it with shame and loathing of myself. I can­na even see you now with­out…” His fore­head rest­ed on knot­ted fists, knuck­les dug hard into his eye-sock­ets. The ten­dons of his neck were sharply etched with strain, and his voice came half-muf­fled. 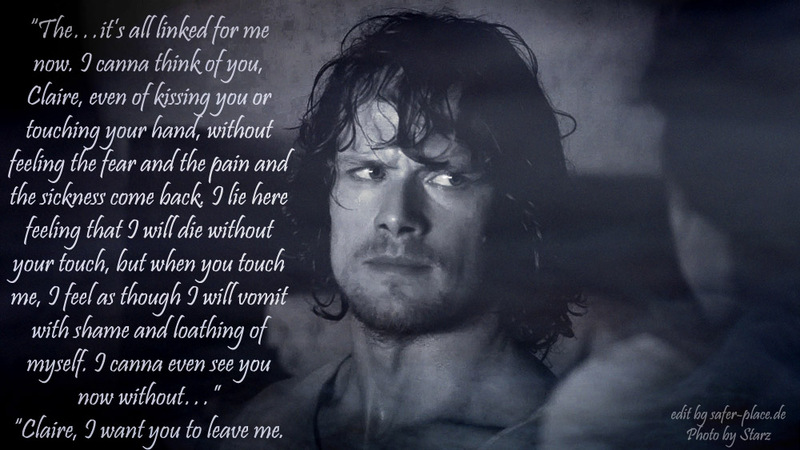 “Claire, I want you to leave me. Go back to Scot­land, to Craigh na Dun. Go back to your place, to your…husband. Murtagh will take you safe, I’ve told him.” He was silent for a moment, and I did not move.He looked up again with des­per­ate brav­ery, and spoke very sim­ply. I start­ed up to go to him, but he stopped me with a sud­den motion of his hand. He was half dou­bled up, face con­tort­ed with inter­nal strug­gle, and his voice was stran­gled and breath­less. 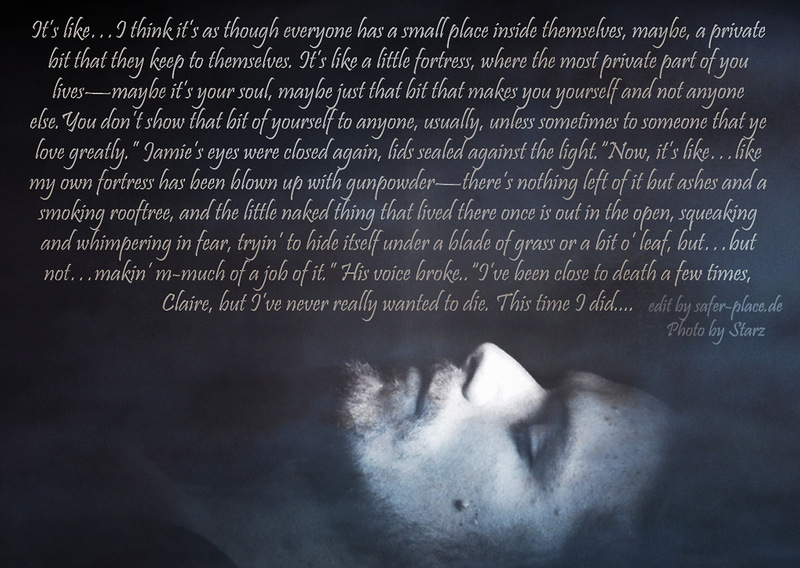 “Claire…please. Please go. I’m going to be ver­ra sick, and I don’t want you to see it. Please.”I heard the plead­ing in his voice and knew I must spare him this one indig­ni­ty, at least. I rose, and for the first time in my pro­fes­sion­al life, left a sick man to his own devices, help­less and alone. I didn’t get to fin­ish my last com­ment. Thank you so much; you do such love­ly work. The large images & the clear text- great!!! All beau­ti­ful­ly put togeth­er too- love your work. I read the books a while ago & of course the tv series make me want to read them again. But DG’s words, she is gift­ed with such ideas and being able to com­pose a sto­ry that is unimag­in­able and so .… Thank you for shar­ing such love­ly excerpts. I found you today & hope to return again.